Toyota is set to become the world’s first auto maker to use biohydrin, a newly developed biosynthetic rubber product, in engine and drive system hoses. Jointly developed by Toyota, Zeon Corporation and Sumitomo Riko Co., biohydrin rubber is manufactured using plant-derived bio-materials instead of epichlorohydrin, a commonly-used epoxy compound. As plants absorb CO₂ from the atmosphere during their lifespan, such bio-materials achieve an estimated 20% reduction in material lifecycle carbon emissions (in comparison to conventional petroleum-based hydrin rubber). The first vehicles to use vacuum sensing hoses made from biohydrin rubber will be produced in May, with usage expected to be rolled out to all Toyota automobiles manufactured in Japan by the end of this year. Engine and drive system hoses require a particularly high level of oil and heat resistance. Since epichlorohydrin offers exceptional oil resistance, heat resistance, heat aging resistance, ozone resistance and gas permeability, it is currently commonly used as a key compound in the production of rubber for components such as hoses. Production of biohydrin rubber uses a variety of compound technologies for bonding plant-derived materials with petroleum-derived materials at the molecular level. These technologies ensure that biohydrin rubber provides the levels of oil resistance, heat resistance, and durability required for vacuum sensing hoses in engines and drive systems. Additionally, biohydrin rubber is similar to conventional petroleum-based hydrin rubber in terms of quality and mass producibility, enabling large-scale use in commercial vehicles. In the future, Toyota plans to expand the usage of biohydrin to other high-performance rubber components, such as brake hoses and fuel line hoses. 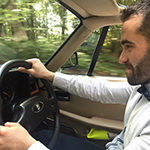 Using biohydrin rubber in vehicles represents a small but important step toward meeting a range of ambitious environmental targets outlined by Toyota in October 2015. Collectively referred to as the Toyota Environmental Challenge 2050, these targets represent the company’s comprehensive roadmap for contributing to global environmental sustainability. Going forward, Toyota will continue to develop and commercialize technologies that enable the use of materials like Ecological Plastic and biosynthetic rubber in a wider range of components.